LISTED, GLOBE & MAIL'S "BEST SUSPENSE NOVELS TO READ AT THE COTTAGE"
Vancouver PI Dave Wakeland is back--this time staring down the knife edge of corruption and murder. No one knows what happened to Tabitha Sorensen. The brilliant but troubled student seems to have vanished, leaving a deadly trail of missing millions and links to a notorious family of criminals. Hired to find her, Wakeland matches wits and fists with suburban gangsters, corrupt authorities, and a contract killer with a fondness for blades--one of which seems destined for Wakeland's throat. Aided by Sonia Drego, a police officer and former lover with dangerous secrets of her own, Wakeland must uncover the deadliest killer that the morally challenged young detective has ever faced. From the back alleys of a rapidly changing Vancouver, to the wilds of Washington, to a suburban sprawl where things aren't what they seem, Wakeland crosses borders--and lines--in a treacherous game of cat and mouse that pushes him to his limits, and threatens to leave everything he cares for in pieces. all the way to its exciting, unputdownable conclusion." "A highly intelligent and satisfying page-turner." on the classic femme fatale trope, this is crime fiction at its best." Publishers Weekly (starred): "Convincingly brings Raymond Chandler into the 21st century." iBooks: One of Winter 2018's Most Anticipated Reads. "A fantastic noir mystery set in Vancouver." Washington Independent Review of Books: "What a pleasure it is to encounter a new voice, a new kind of edginess, a contemporary formulation of detective fiction that has the heft and distinction of the genre’s classics." Brett Josef Grubisic, Vancouver Sun: "Grippingly twisty entertainment, the story also offers provocative thoughts about the state of the west coast’s soul." Andrew Gulli, The Strand:"Sam Wiebe is going to become a modern master of noir." Benoit Lelievre, Dead End Follies: "Sam Wiebe is a master of tone and atmosphere." 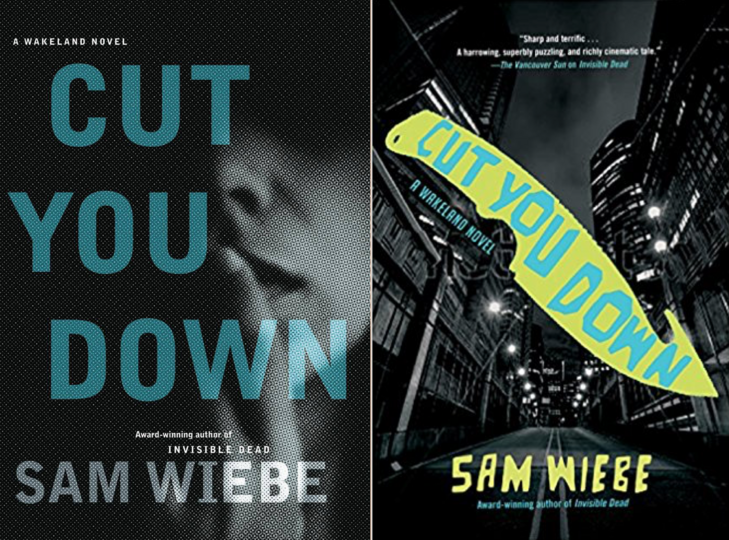 Tara Henley, Toronto Star: "Sam Wiebe’s excellent new novel, Cut You Down...proves a study in both riveting crime writing and stark social realism." Midwest Book Review: "Another deftly crafted gem by a master of the genre, Sam Wiebe’s Cut You Down is a riveting read from cover to cover." Margaret Cannon, The Globe and Mail: "A terrific return for PI Dave Wakeland." Bookshelf: "Wiebe manages to pack in a profound amount of thought and compassion and criticism of the genre...while never skimping on the joys of it." BOLO Books: "Perfect for readers who enjoy an atmospheric social novel in which setting and character merge to create a powerful whole." Susan Hoover, Reviewing the Evidence: "An edge of the seat thriller. I held my breath through the last fifty pages...Wiebe has done a great job of scaring the pants off the reader." Mystery People: "A fresh pin on the tough yet emotionally vulnerable private eye." David Nemeth, Unlawful Acts: "Wakeland’s humanity is the driving force in Cut You Down making this one of the better private eye series around." Tim Suddeth, Killer Nashville: "Wakeland harkens back to such private eyes as Sam Spade, Philip Marlowe, and other crime noir detectives...With fast action and numerous twists, the reader will find themselves wanting to get to the next page." Col's Criminal Library: "4.5/5...Wiebe serves up another compelling, edge of the seat tale." Jessica Map Reviews: "I loved the rough around the edges Wakeland. I can’t wait to see where Wiebe takes him next!" Steve Aberle: "A a first-class story...a compulsory P.I. novel of the best kind." Unnerving Magazine: "CUT YOU DOWN has thrills and suspense, emotion and grit. Quality read." The Georgia Straight: "Wiebe sharpens his prose to a point and uses his twisting, high-paced plot to take on big themes about money and the warping pressure it exerts on everyone it touches." Bill Selnes, Mysteries and More: "Superb Noir Fiction." Cemetery Dance Magazine: "Wiebe inflects a love of the language that comes across as sincere and natural, mixing the dark and light with wit. Recommended for noir fans." Crimereads: Chosen as one of Our Favourite Crime Books of the Year. "No one is writing contemporary Vancouver better than Sam Wiebe." Dead End Follies: Chosen as a Best Read of 2018: "For dealing in nuance and precision, and ushering contemporary issues into detective fiction."